To configure the web launcher settings for the web application, open the management console. Go to Settings > Manage Web Application > Application Launch in the management console. 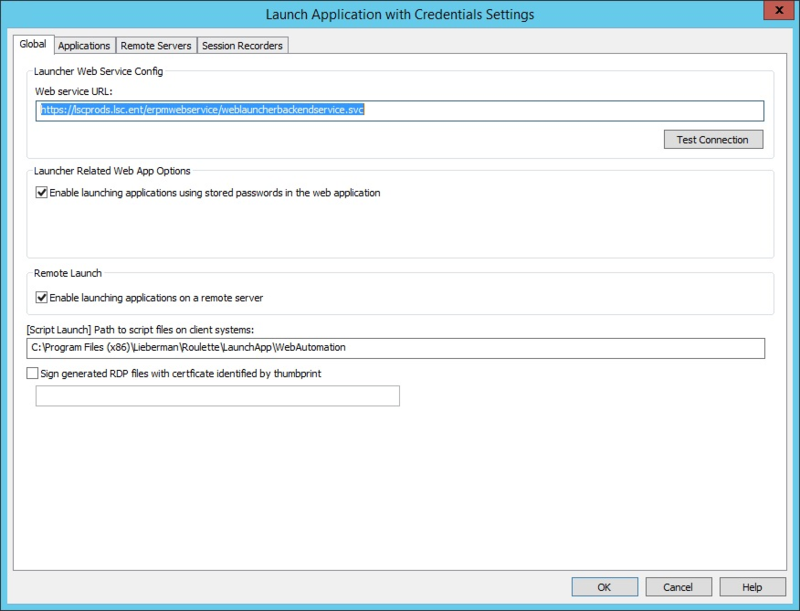 The Launch Application with Credentials Settings dialog opens. The Global tab identifies the URL for the web service and other related settings used when launching applications. Enter the web service URL. Web service URL: The URL of the application launcher web service. When the web service is installed, a web service is created at [site]/erpmwebservice. The web service is called WebLauncherBackendService.svc. Enter the full URL in the Web service URL field, including the protocol and port if applicable. The typical URL is:https://erpmwebservername.example.com/erpmwebservice/weblauncherbackendservice.svc. Click Test Connection to verify the web service URL is correct and the web service is properly responding to requests. Check the Enable launching applications using stored passwords in the web application box. This option enables remote launching. If this option is not selected, the Launch Application option is unavailable in the website. Check the Enable launching applications on a remote server box. This option enables configured applications to launch via the jump server rather than launching locally on the client. When the option is enabled and an application is configured to use the jump server, the applications launch from the jump server and use RemoteApp to display the program's user interface to the user's desktop. Enter the path where the script automation files will be copied to in the [Script Launch] Path to script files on client systems field . This path is used when locally launching web-based applications.. If local launching will not be used, you do not need to configure a path. The default location where these scripts are found is C:\Program Files (x86)\Lieberman\Roulette\LaunchApp\WebAutomation. The certificate must be on the client workstation to generate RDP files and connect to the jump server. If RDP connections are configured to go through the jump server, the certificate also must be on the jump server. The certificate must be accessible to the user running the process of creating and launching the RDP file. The security policy of the machine must be configured to require signed RDP files for this setting to have any effect.